What is the Best Way to Sell Old Jewelry? 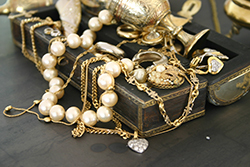 Many people have old jewelry lying around at the back of a drawer or in a jewelry box that they never wear, but instead of leaving it there why not consider selling it to make some extra money. There are two main ways to sell old jewelry by either selling it as a piece of jewelry or selling it for the price of the metal as scrap. The amount you get will depends on the standard of the original piece, for example how much gold is in it and the quality of the stones. If you want to control the sale of your jewelry then consider selling it on an online auction site. There you can write your own advert, set your own prices, and control the conditions of the sale. Listing items for sale on online auctions is easy to do once you have set up an account, but the downside of these auction sites is that you will probably be competing against thousands of other people also trying to sell their jewelry. To make your pieces stand out, make sure you have a good description and be honest about any damage to the jewelry. Adding a photograph can help your sales because people are more likely to look at goods with photographs. Make sure you price competitively, but do not accept less than you want for your jewelry. If you do not want the bother of running an online advert, you could try to sell jewelry to a local shop or antiques dealer. Bear in mind that you might not get as much for your jewelry if you sell to a dealer because they will want to buy it as cheaply as possible to maximize their own profit. If you do not think you can sell your jewelry as it is, you can always try selling it to a dealer for its scrap metal value. The most common metal sold for scrap is gold, but you need to remember that if you sell your jewelry for scrap the price will only be determined by the amount of gold in it, not by the workmanship or design of the piece. You will find gold dealers online who will normally send you a courier pack in which you can send your old jewelry to them for appraisal. If you accept their price, the money is normally deposited straight into your bank account. Alternatively, you can visit a gold dealer in person, where they will weigh your jewelry and negotiate a price. Make sure your jewelry is in good condition before you photograph it or take it to a dealer. Good, clean jewelry will be more likely to command higher prices. If your jewelry is antique or has many precious stones in it, then consider getting it professionally appraised. This will give you an idea of the value. If you are selling jewelry that contains stones for scrap, see if you can take the stones out before you go to the dealer. Remember you will not be paid for the stones, only the weight of the gold. You can check the price of gold online before dealing, so you have an idea whether the buyer is offering you a fair price. You probably will not make a fortune from selling your old jewelry, unless you stumble across a valuable antique piece in your jewelry box, but you should make enough to buy yourself a new treat, or to help with unexpected bills. The price of gold and other precious metals is holding steady on today’s world markets. Over the past decade, investors have been increasing their holds on these commodities. This undoubtedly filters down to the retail sectors and jewelry businesses. So, what does this mean for someone who is contemplating the value and sale of their antique jewelry? You may be considering the profits that can be made by selling your great-grandmother’s wedding ring, or you may at least be curious of its worth.